The market place is full of different ways to fight corrosion. 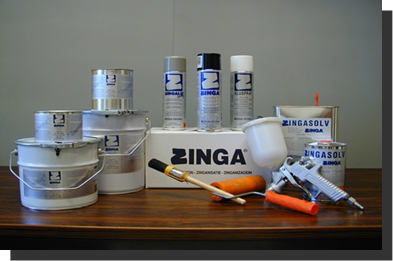 ZINGA, based and developed in Belgium, combines the attributes of two principle techniques: the galvanic characteristics of hot dip galvanising and the barrier protection of a paint. ZINGA is a one component compound containing 96% of ZINC in its dry film, providing an excellent active, galvanic protection to steel. Upon oxidizing, zinc oxides form a layer over ZINGA offering a complementary barrier protection as paints. Not only ZINGA is resistant to UV and has fire retardant properties, the dry film can be in contact with potable water as certified to BS6920. Structures that have previously been metallised/coated by thermal zinc spraying. Zinganised structures to recharge the old zinc layers to renew protection. Areas damaged by welding, cutting, drilling, riveting, transportation and etc… as a touch up to the galvanised or zinganised layer. ZINGA is a one-component anti-corrosion zinc coating system which contains a minimum of 96% zinc in the dry film. Its unique formula provides cathodic galvanic protection to steel comparable with hot-dip galvanising and as easy to apply like paint. It is available in 5 Kg, 10 Kg and 25 Kg cans. ZINGA SOLV is the recommended thinner to be used with ZINGA when spraying. It can also be used for cleaning equipment. It is available in 5 litre and 10 litre tins. Aquazinga is a two-pack, 100% water-based anti-corrosion system. It is based on inorganic zinc silicates and, with its high zinc content (92% in the dry film), it provides cathodic protection to ferrous metals. Aquazinga is highly resistant to abrasion and is designed to withstand corrosive environments and severe conditions, including high temperatures (up to 600 degrees C). As a stand-alone system, it can be used as an alternative to hot-dip galvanising and metallisation. It can also be used as a primer under high-heat paints.